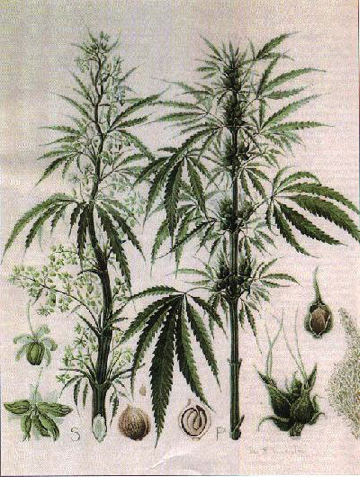 Each iHemp variety has its own set of characteristics; small or large seed, low or high oil content, different oil composition, etc…. Varieties grown for fibre may contain from 15-25% bast fibres. As markets develop contracts to grow iHemp may specify the exact varieties that will meet specific market needs. 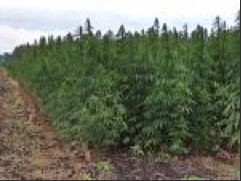 iHemp varieties tested in Ontario, Canada so far have all been of European origin with the exception of new Ontario-bred varieties such as “Anka” and “Carmen” and they come in 2 types; “dioecious”, which have male & female flower parts on separate plants (i.e. : “Kompolti” and “Unico B”) and “monoecious”, which have male & female flower parts on the same plant (i.e. : “Ferimon” and “Futura”). A 3rd type of cultivar, known as female predominant, is a dioecious type that has 85-90% female plants. It is believed that this type of plant can yield more grain. Most French varieties are a hybrid of predominantly female types. Only varieties of iHemp that are named in the list of approved cultivars, published by Health Canada, are approved for planting in Canada. These varieties are known to produce plants containing less than 0.3% Tetrahydrocannabinol (THC) under normal conditions. The THC level may vary with stage of growth and increase under environmental stress conditions. They mature to fibre in 60-90 days and to grain in 110-150 days. Using home-grown or “common” seed is illegal. Most of the French and Romanian cultivars are suitable for grain and fibre production however these tall cultivars present some challenges for harvesting because growers need also to consider that weather conditions after grain harvest (late August or September) may not be suitable for retting & drying the stalks. The FIN 314 variety, which will grow to a maximum height of 0.9 meters (36 inches) and other short-stalked grain types (1-1.5 meters) are not suitable for dual production. Industry trends seem to be moving specifically towards grain or fibre varieties. iHemp responds to a well drained, loam soil with pH (acidity) above 6.0. Neutral to slightly alkaline (pH7.0 - 7.5) is preferred. The higher the clay content of the soil the lower the yield of grain or fibre. Clay soils are easily compacted and iHemp is very sensitive to soil compaction. Young plants are very sensitive to wet soils or flooding during the first 3 weeks or until growth reaches the fourth internode (approx. 30 cm or 12” tall). 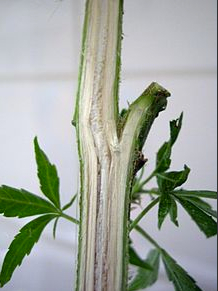 Water damaged plants will remain stunted, resulting in a weedy, uneven and poor crop. Poorly structured, drought-prone sandy soils provide very little natural fertility or support for the iHemp plant. Extra nutrients and water will be required to achieve maximum yields on these soils, hence the extra costs make production uneconomical. iHemp requires lots of moisture; approx. 3-400mm (10-13”) of rainfall equivalent. If that amount of rainfall does not occur during the growing season it is important to make use of early soil moisture and to get early ground cover to reduce surface evaporation, as well as maintain good weed control. About ½ of this moisture is required during flowering and seed set in order to produce maximum grain yields. Drought during this stage produces poorly developed grain heads and continued drought results in low yields of light grain. During the vegetative growth period iHemp responds to daytime high temperatures with increased growth and water needs. After the 3rd pair of leaves develop iHemp can survive daily low temperatures as low as -0.5 degrees Celsius for 4-5 days. 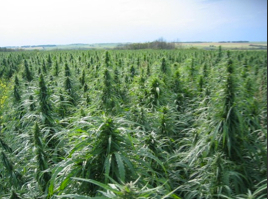 iHemp requires approximately the same fertility as a high-yielding crop of wheat. Apply up to 110kg/hectare of nitrogen, depending on soil fertility and past cropping history. 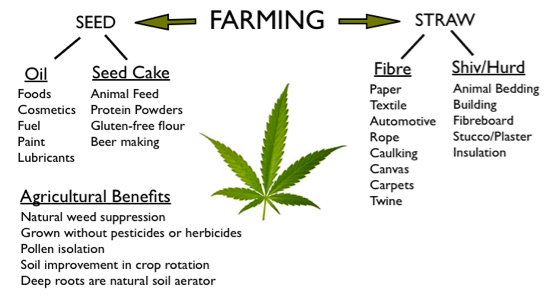 Research also supports the application of 40-90kg/hectare of potash for fibre hemp. Base your phosphorus (P205) and potash (K20) applications on a recent soil test. To interpret soil test information, follow the nitrogen, phosphate and potash recommendations for winter wheat in OMAFRA publication 811, “Agronomy Guide for Field Crops”. 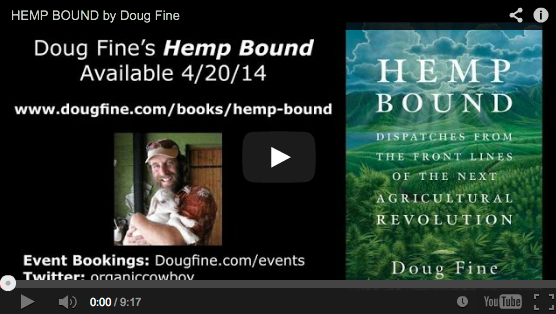 Hemp growers in some places may benefit from adding sulphur. It is important to balance the nutrients with the crop requirements. For example; excessive nitrogen, combined with inadequate potash, can result in stalk breakage and loss of crop ! Approximately 42% of the plant’s biomass returns to the soil in the form of leaves, roots and tops. These contain over half of the nutrients applied to the crop in the first place and many of these nutrients will be available to help feed the following crop. If hemp is planted into well-drained, fertile soil under nearly optimum temperature and moisture conditions, it will germinate quickly and reach 30 cm (12”) in 3-4 weeks from planting. At this stage it will give 90% ground shade. Weed growth is suppressed by the exclusion of light from the soil. A rapidly growing iHemp population of 200-250 plants per square meter will suppress nearly all weed growth, including twitch grass. For pre-plant site preparation guidelines, refer to OMAFRA Publication 75, “Guide to Weed Control”. Weed suppression is not a permanent condition. Weeds may appear on the same field next year if the field is rotated out of iHemp production. Perennial grasses may be weakened or killed if iHemp is grown a 2nd year on the same ground however this practice increases the chance of crop diseases to develop. Under grain production conditions weed suppression may be less complete; the lower plant population or uneven stands allow more light to penetrate the canopy, thus aiding the germination of weed seeds. Cross seeding may improve canopy distribution and subsequent weed control where early, shorter verities are grown. In conclusion; early planting, as soon as the soil is warm enough, is the recommended weed strategy. More than 50 different viruses, bacteria, fungi and insect pests are known to affect the iHemp crop. However, iHemp’s rapid growth rate and vigorous nature allow it to overcome the attack of most diseases and pests. Botrytis Cinerea (grey mould) and Scierotinia Scierotiorum (white mould) are common moulds affecting iHemp. Scierotinia also affects edible beans, canola and sunflowers. Mould spores may be spread by combines, other harvesting equipment and straw. A 4-year crop rotation is recommended as a good practice to avoid disease build-up. 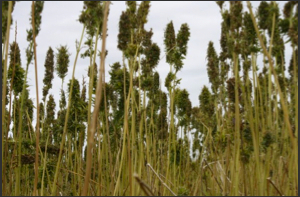 Do not grow iHemp on the same fields following canola, edible beans, soybeans or sunflowers. Wind and hail damage can be significant to the iHemp crop. Tall plants with lots of upper leaf mass can be bent quite easily by mid-to-late summer storms. Broken plants will recover partially if not broken too low. This results in significant variability in plant height and maturity at seed harvest time. Air-dry stem yields range from 2.5-14.0 metric tons of dry, retted stalks per hectare (1 to 5 tons/acre) at 12% moisture. Approx. one ton of bast fibre and 2-3 tons of core material can be decorticated from 3-4 tons of good quality, dry-retted straw. Yield of fibre depends on both the stalk yield per hectare and the fibre content of the stalk. Varieties differ in the amount of actual fibre content and on the ratio of bast fibre to core material (hurds). Dioecious varieties originating in southern Europe give the highest stalk yields. For textile applications, cut the iHemp in the early flowering stage or while pollen is being shed, but before seed sets. Fibre that is cut after seed harvest will have lignified considerably and is usable only in some non-woven industrial fibre applications. In dioecious varieties the male plants die back after shedding pollen. This results in lower fibre yields if the straw is cut after grain has matured. On small acreages, good quality sickle-bar mowers and hay swathers have been used to cut iHemp. Frequent plugging has been a constant problem with this equipment. It is important to keep knives sharp and in good repair at all times. As acreage increases, more sophisticated equipment may have to be imported or developed. Retting is the process of beginning to separate the bast fibres from the hurds or other plant tissues. This is done in the field, taking advantage of the natural elements of dew, rain, wind and sun, or under controlled conditions using water (most common in China), enzymes or chemicals. The method chosen depends on the end use of the fibre or hurd. To date, suitable industrial processes of water and/or chemical retting have not been developed. Successful field retting requires a delicate balance of nightly dews and good daytime conditions. Planting date and selection of variety are factors in predicting a suitable harvest date for your region. The length of the retting process is critical for optimum fibre yield and quality. It normally takes 21-28 days to complete but dry weather and low dew conditions may require longer retting periods. In fact, the process can take as little as 2 weeks. The “windrows” are turned vigorously once or twice with tines (rakes) to facilitate even retting of the windrow and to knock the leaves off the stems. It is important that the retting process be complete before baling, so that the fibres reach the desired colour and do not rot or discolour in storage. In wet conditions a 3rd turning may be necessary. Baling can be done with any kind of baler. Large round, soft-core balers may are more satisfactory, allowing bales to fry more quickly in storage. For some industrial processes, the buyer may require a uniform large, square bale, to fit into the processing system however this may present a challenge in preventing spoilage if the bales are stored for later delivery, as square bales are packed more tightly, allowing less air passage than round bales. Note: Sisal or Hemp twine must be used to tie bales because polyester and plastic twines become contaminants in the processing of hemp fibres. Bales must be stored indoors under dry conditions to stop the retting process before the fibres become rotted. Stalk moisture should be less than 15% at time of baling and should continue to dry to about 10%. Hemp straw also absorbs air moisture quite readily. 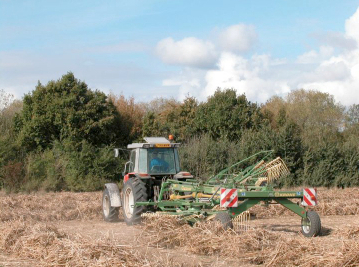 When iHemp is grown for both grain and fibre it is necessary to re-cut the tall stalks after combining. A combine can be modified to perform both functions at the same time by mounting a sickle-bar mower under the header to operate close to the ground. It is expected that as markets for grain and fibre begin to differentiate dual harvesting will cease to be a common practice. 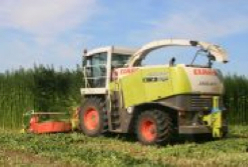 Growers of small acreages will most likely continue to combine and cut stalks as 2 separate operations. If straw is to be harvested after combining it is important that the weather conditions must also be suitable for drying the stalks for baling. Combining iHemp gives a special challenge to both the combine and the operator. In tall varieties large quantities of plant material are put thru the combine. 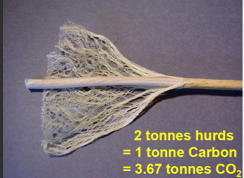 iHemp straw contains very tough fibres that tend to wind around the moving parts. Fine fibres work into bearings, causing friction that can lead to bearing breakdown and combustion. These factors cause heavy machinery wear, high maintenance costs and a great deal of time loss and frustration on the part of the operator. Early grain varieties like “Fedora 19”, “FIN314” and “Fasamo” are shorter and easier to combine. 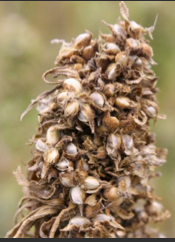 iHemp seed is harvested when the seed begins to shatter. At this optimum harvest time about 70% of the seeds are ripe at about 22-30% moisture. Later combining increases grain losses due to shattering, bird damage and lower quality grain. Mature fibres tend to wrap more tenaciously around moving parts on the combine. Raising the cutting blade to about 1 meter (40”) or as high as the header will cut effectively, reduces the amount of material entering the combine. With shorter varieties use a “closer-to-normal” header position. The header knife must be kept sharp at all times to minimise winding of fibres on the sickle bar. Replacing the slatted feeder conveyor with a belt helps reduce the amount of fibre that winds on the feeder shaft. Exterior rotating shafts and pulleys that may come in contact with stalks should be protected when harvesting taller varieties. Run feeder housing chain loose in the corn position and close the pre-cleaner. Lower the beater gate, remove the curtains and install a speed-up kit for the beaters. Individual combine operators might find different settings work for their machines. Rotary combines seem to be less satisfactory for harvesting hemp grain because of tendency to plug more readily. Some “volunteer” hemp (also called “Ditch Weed”) will likely appear in the fall or spring following the iHemp crop. These plants are illegal and must be destroyed before being discovered by local drug enforcement authorities. Thorough cultivation or seedbed preparation is effective.